"Natural Resources Management Act includes NH priorities, now goes to president"
Legislation to Protect Nashua River and its Tributaries. View full press release HERE. 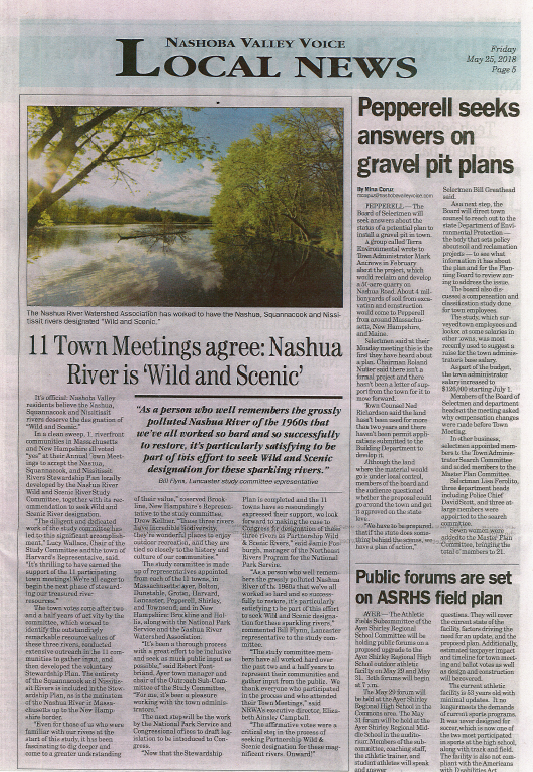 "OPED: TIME FOR A MASSACHUSETTS WILD AND SCENIC RIVERS DESIGNATION"
"Nashua River Wild and Scenic Passes Vote"
"11 Town Meetings agree: Nashua River is `Wild and Scenic'"
"Shirley Town Meeting OKs Most of Warrant"
"Protecting a Bit of Wild & Scenic Dunstable At No Cost to You"
"`Wild and Scenic' designation sought"
"Nashua River Study Heading to Bolton, Lancaster Town Meetings"
"Nashua River could earn `Wild and Scenic' designation"
"Will the Nashua River be designated `Wild and Scenic?'" "Move to highlight the Squannacook River"